IT ALL STARTS, Saturday, Dec. 24, with breakfast in The Living Room, followed by stretching exercises at Six Senses Spa, cooking class at Benz Restaurant, where you can create your own lunch, served at The View, or lunch at the North Beach for fresh salads an Australian beef and a New World wine. Christmas Eve festivities include drinks at The View, with carol singing by children from the Klong Jao School, Koh Hood, and Christmas canapés, followed by Christmas Eve dinner, served outside The Living Room, featuring Butter Ball turkeys from the U.S., farmhouse herb stuffing. There’s also a carving station, offering New Zealand lamb and Wagyu beef from Australia, served with mulled wine or Gluhwein. On Christmas Day, breakfast will last until 11.30 a.m., followed by Christmas lunch, starting at 12.30 p.m., featuring Catch of the Day from the bays of Koh Hood; and Christmas Dinner at The View and The Benz, that will feature a European Classic Christmas Dining Table. Boxing Day, Dec. 26, will be a busy day. Breakfast in The Dining Room, followed by a range of activities that include Muay Thai, Tai Chi, a tour of Koh Rang National Marine Park, the underworld of Koh Yak and Koh Yak Yai, and cooking class at The Wood Oven. Two alternatives for lunch: Japanese lunch at The View, or Aberdeen Angus bergers and “buckets of beer” at The North Beach. Dinner will feature Old and New World wines at The View and The Benz. New Years Eve, Dec. 31, starts early with cocktails from 2 to 5 p.m. on the beach to the sounds Tonga’s Calypos Singers, followed at 6 p.m. for a New Year’s Eve performance at the resort’s outside Cinema Paradiso. Count down festivities start at 10.30 with a special New Year’s Eve culinary journey in The Dining Room, followed by special performances by Whisky Kiss, highland and break dancers as guests and performers welcome in 2017. SIX SENSES SAMUI has unveiled its latest sustainability initiative – Farm on the Hill – in its quest to be more environmentally conscious and to offer an authentic Thai farm experience to guests. The farm may be small, yet it adds big purpose and value to the resort’s operation while benefitting the local community. The farm’s inception was born from a landscaping necessity, which includes a large volume of organic waste generated (e.g. branch trimmings), unutilized grey water, and lack of nutrient rich soil. All the resort needed was 15-20 goats, 80 chickens, one simple greywater catchment system and the problem was solved. Six Senses Samui now has nutrient rich soil and is able to produce organic eggs, goat milk and an abundant crop of fresh vegetables. Other valuable features include a natural reed bed system to filter and remineralize the grey water, which can be used for irrigation – a creative waste to wealth garden and a module aquaponic system that is solely constructed from reclaimed waste materials. Farm on the Hill is not only a sensible step in the right direction, it has also become a popular fun and learning experience for all ages. Guests, hosts and the local community can enjoy feeding the goats, collecting newly laid eggs and even picking organic produce for their next meal. It also adds value to guests’ experiences. Guests can reserve Farm on the Hill for dinner and take in a private sunset tour of the grounds before enjoying a rurally-wholesome Thai barbecue. “Farm on the Hill started as a small home-grown initiative to support our commitment to sustainability in the resort and our operations, yet in a short time it has grown into a positive example of what can be done with strong conviction and minimal funds,” said Gary Henden, general manager of Six Senses Samui. THE DHARA DHEVI CHAING MAI is offering a memorable collection of seasonal accommodation and dining specials to mark the festive season. Wellness Centre; complimentary Christmas Dinner on Christmas Eve, Dec. 24, 2016, for two persons at Akaligo restaurant; Or a complimentary Festive Gala Dinner on New Year’s Eve, Dec. 31, 2016 for two and a bottle of hampagne; roundtrip transfer from/to Chiang Mai International Airport. Terms and Conditions: A minimum of three nights stay is required; Christmas offer from Dec. 22-16, 2016 and New Year offer from Dec.29, 2016 to Jan. 3, 2017. Additionally, The Dhara Dhevi Chiang Mai is featuring a selection of specially prepared holiday dining experiences to eat, drink and be merry. Christmas Eve program on Dec. 24 dinner offer at both Akaligo and Le Grand Lanna complete with Christmas carols and a special visit for the hotel’s young guests from Santa Claus, himself. The Christmas Eve Gala Dinner at Akaligo restaurant, priced 4,500 THB per person and 2,250 THB per child ages between 6-12 years old. A group of Carol singers will be performing their Christmas repertoire before Santa makes his appearance. There’s also a Christmas Day Set Dinner at Farang Ses, featuring contemporary French dishes at the resort’s regal French restaurant overlooking the property’s rice fields, priced at THB 4,100 THB per person. New Year’s Eve Gala Dinner – New Year’s Eve is always a grand occasion at The Dhara Dhevi Chiang Mai, and this year that tradition is set to continue with “Carnival of Colours” as the theme for the evening’s celebrations. Guests are welcomed with cocktail party at the Red Square (below the main lobby), followed by a Gala Buffet Dinner on the Ceremonial Lawn from 8 pm to priced 12,500 THB per person, including one bottle of Champagne per two persons. The New Year’s entertainment includes a live band with international singer, vibrant shows, DJ and countdown ground fireworks. The Wine Spectator Award of Excellence is granted to wine lists which satisfy discerning wine lovers with at least 90 selections, comprising a well-chosen assortment of quality producers, along with a thematic match to the menu in price and style. The even more prestigious Wine Spectator Best Award of Excellence recognizes destinations for serious wine lovers. Showing a deep commitment in terms of cellar selection, service offering and superior presentation, these wine lists feature 350 or more labels that display excellent breadth across multiple winegrowing regions from top producers. Anantara’s expertise in the world of fine wines is held in high esteem by guests, and also by the industry, with 26 Wine Spectator 2016 Awards a testament to the diversity and sophistication. Wine Spectator’s Restaurant Awards recognize restaurants, whose wine lists offer interesting selections, are appropriate to their cuisine and appeal to a wide range of wine lovers. “The Wine Spectator awards are known worldwide as a guide to the world’s best wines and we are honoured to be part of the Wine Spectator awards which recognizes restaurants that show passion and commitment when it comes to wine,” said Jirachai Sethisakko, chief wine guru for Anantara. In Thailand, 11 restaurants at Anantara resorts have been presented with a Wine Spectator Award of Excellence, including: Baan Dhalia at Anantara Golden Triangle Elephant Camp & Resort; The Service 1921 and The Restaurant at Anantara Chiang Mai Resort; Madison Restaurant at Anantara Siam Bangkok Hotel; Sea.Fire.Salt. at Anantara Mai Khao Phuket Villas and Tree Tops Sky Dining at Anantara Lawana Koh Samui Resort. In Vietnam, Riverside Café at Anantara Hoi An Resort provides a terrace to sample distinguished wines with gourmet western and Vietnamese favourites. In Bali, MoonLite Kitchen & Bar at Anantara Seminyak Bali Resort showcases contemporary Asian cuisine with a premium wine list of over 100 labels. At the newly opened Anantara Peace Haven Tangalle Resort along Sri Lanka’s southern coast, Il Mare serves delectable Italian cuisine with exquisite wine pairings on a cliff edge with astonishing Indian Ocean views. In the UAE, six Anantara restaurants have been honoured with a Wine Spectator Award of Excellence. Anantara The Palm Dubai Resort scooped three of these for its Australian grill restaurant Bushman’s, Mediterranean restaurant The Beach House, and specialty Asian dining venue Mekong. In the vast Liwa Desert, guests of Qasr Al Sarab Desert Resort by Anantara’s Suhail steakhouse and rooftop lounge. While at the Sir Bani Yas Island Resorts, seafood specialties at Amwaj are enjoyed with an Arabian Sea view, and sumptuous grill dishes at Savannah are served in the heart of the Arabian wildlife park, each with a generous global wine selection. Fine wines elevate dining, with six restaurants at Anantara resorts in the Maldives given Wine Spectator Awards, including two boasting the Best Award of Excellence. Descending to the exclusive underwater restaurant and wine cellar Sea at Anantara Kihavah Maldives Villas, wine aficionados are regaled with 360 labels, allowing diners to indulge in extraordinary gastronomy with a surreal panorama of tropical marine life. “We research the latest trends and the most popular selections every year, and update our wine lists to ensure that we provide a wide variety of new and old world wines, offering guests quality and variety,” said Sethisakko concluded. Emmanuel Renaut is a rare breed in the culinary world, holder of the prestigious “Meilleur Ouvrier de France” (Best Craftsmen of France) and “Compagnon du Tour de France” (Companion of the Tour de France). He has been awarded three stars in the renowned Michelin Guide®. A man of enormous talent, Chef Emmanuel Renaut founded Flocons de Sel in 1998 and he received his first Michelin star in 2003, the second one in 2006, and his third was awarded in 2012. In 2012, Emmanuel Renaut was also named “Cooking Chef of the Year”. Today, his widely celebrated skills in transforming the natural and local ingredients of the Alps into colourful, fragrant and succulent dishes have earned universal praise. The 10-Course Set Dinner is available on Nov. 24, 25, 26 and 28. Cost per person for food – 11,000 THB, and 13,000 THB for food and wine pairing. Dinner is served at 6.30 pm. The 5-Course Set Lunch is available only on Nov. 28. Cost per person is 5,500 THB for food and 7500 THB for food and wine pairing. Lunch is served at 12 noon. A NEW NAME has been added to Pattaya’s hospitality lineup – AVANI Pattaya Resort & Spa, located in the heart of the city on Pattaya Beach, is now open for business, offering great sea views and a relaxed vibe. Previously operated as Pattaya Marriott Resort & Spa, the 298-room resort has undergone a US$5 million facelift in refurbishing the resort, including guest rooms, meeting rooms, the Elephant Bar and Garden Café Restaurant, plus a new eatery called The Pantry, where guests are able to eat, grab a quick bite or stock up their mini bars. AVANI Sea View and AVANI Garden View Rooms, along with the AVANI Garden Terrace Suites have been redesigned to offer an improved use of space and a host of modern comforts. The design is contemporary, using a subtle and stylish neutral colour palette to create restful and soothing space, while the newly refurbished Garden Café Restaurant offers a tranquil spot for breakfast, lunch and dinner. The design style is organic, natural and uncluttered with warm textures and muted tones of plum, grey and shades of white. Its varied buffet offers international fare and classic Thai dishes. Lunch and dinner favourites include the seabass, with masala sauce, pumpkin risotto and local tiger prawns. 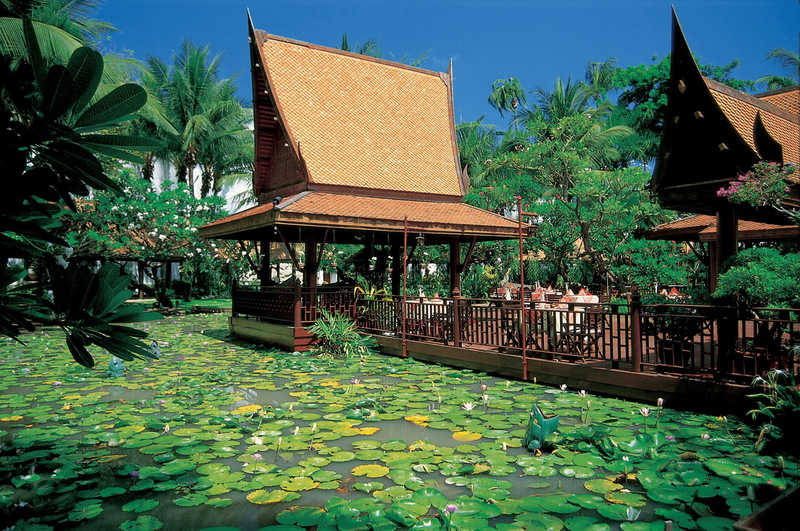 Sala Rim Nam, the resort’s open-air Thai restaurant, is encircled by lotus ponds and tropical flora, offering a Thai culinary journey surrounded by the sea breeze and the fragrance of Frangipani blossoms. Standout dishes include the Massaman chicken curry and Choo Chee salmon. Its AVANISpa offers a different approach to wellness, focusing on each guest’s individual needs rather than offering only standard treatments. The therapist conducts a consultation with the guest to accurately determine what treatment the guest really needs. Treatment options include Boost, Balance, Calm and Purify. Rejuvenating Boost treatments are an antidote for those suffering from low energy and jet lag. Balance treatments ground the body, mind and mood and Calm treatments release muscle tension, relieve anxiety and recharge the mind. Purify treatments offer the perfect detox. Guests can also enjoy outdoor treatments in the air-conditioned spa pavilions by the pool. Set within the lush gardens is a 650-square-metre outdoor adult and children’s swimming pool, with a hydrotherapy Jacuzzi plunge pool. Located in the heart of Pattaya and overlooking the beach, the resort is only minutes away from the city’s hotspots and is connected to Royal Garden Plaza. This entertainment mall brings retail stores and family attractions and experiences together under one roof. The selection of restaurants includes world-renowned Benihana, where guests can enjoy ‘eatertainment’ around Teppanyaki style dining. Mall family entertainment comes in the form of Ripley’s Believe It Or Not Museum of oddball finds, Ripley’s Haunted Adventure, Ripley’s 4D Moving Theatre and Ripley’s Infinity Maze, plus, Louis Tussaud’s Wax Museum. Pattaya also offers a wide range of entertainment for kids ranging from The Million Years Stone Park, Crocodile Farm, Upside Down House and Sheep Farm, along with the Cartoon Network-themed waterpark with over 13-acres of family raft rides, speed-racing slides and water-play fortresses. Pattaya is a water sport adventurists dream about. From jet skiing to deep sea fishing, windsurfing and wakeboarding to parasailing yachting, and flyboarding. There are numerous scuba dive centres with PADI dive training courses available for novices and experienced divers, wanting to complete their dive master certification. The weather is fantastic all year round, offering great visibility and diversity of dive sites and Coral Island is just a boat ride away, where the snorkelling and diving is amazing. For those who prefer a quieter beach experience, there’s Tien Beach, Samae Beach and Naon. Golfing enthusiasts will be delighted by Pattaya’s range and diversity of fairways and greens. Pattaya has more than 20 championship golf courses. Many have been designed by golf legends, including Nick Faldo (Great Lakes), Jack Nicklaus (Laem Chabang), Gary Player (Sri Racha) and Robert Trent Jones (Eastern Star). The Siam Country Club is one of Thailand’s finest and most challenging courses, and has played host to international tournaments on many occasions including the LPGA. AVANI Pattaya is 90 minutes by car from Suvarnabhumi International Airport, and the closest major beach destination to Thailand’s capital. MORE THAN JUST A BEACH GETAWAY, Thailand’s largest island, Phuket, is steeped in rich history dating back to the first century. What is now referred to as the Old Town shines with personality and beautiful architecture, including the renowned Sino-Portuguese mansions and shop houses. The district is a showcase of influences from the early British, Dutch, French, Portuguese and Chinese settlers who contributed to the unique heritage and culture of the area. To help travellers discover this colourful side of the island, Amari Phuket is introducing the Phuket Uncovered package which will take guests on a privately guided half-day walk around the Old Town. As guests meander among the various Sino-Portuguese buildings, elaborate shrines and temples, they will discover an area dotted with quirky cafés, museums, beautifully preserved shop houses and markets. After taking in the sites, guests will experience the southern flavours and tastes unique to Phuket with a private cooking class led by an Amari chef. The class will begin with a visit to the local market to explore the source of some of the region’s special ingredients. The Phuket Uncovered package is available exclusively at the Amari Phuket and starts at 16,193 THB for a three-night stay in a Superior Ocean Facing room. The package is available from now until Aug. 31, 2017. For more information, visit www.amari.com/phuket/.